Seen in an historical perspective, the recent Coast Guard activities are anoth- er example of that service's prompt response to new challenges. Natural Resources and Environment of the U.S. General Accounting Office (GAO) testified that chemical facilities may be an attractive target for terrorists. Only those chemical facilities located adjacent to waterways are currently required to prepare and submit security plans. Multi-interfacing; mobile packet and high-speed data service capability; antenna of unique, robust design security plans to the U.S. Coast Guard. Border Protection (CBP) issued a Notice stating that is delaying indefinitely implementation of the change to the "shipper" element of the advance mani- fest filing requirement as provided for in its December 5. 2003 rulemaking under the Trade Act of 2002. The change was scheduled to come into effect on March 4, 2004 and would have changed the "shipper" element of the advance manifest filing required of carriers from "the shipper's complete name and address, or identification number, from all bills of lading" (as pro- vided for in the October 31, 2002 rule- making establishing the 24-Hour Rule) to "the identity of the foreign vendor, supplier, manufacturer, or other similar party" (as provided for in the December 5, 2003 rulemaking). The purpose of the indefinite delay is to allow CBP time to review a petition submitted by trade representatives chal- lenging the definition of shipper. The trade representatives contended that car- riers normally do not have access to the identity of the foreign vendor, supplier, manufacturer, or similar party. The extent of the carrier's information is gen- erally limited to that found on the bill of lading. Until this issue is resolved, CBP will continue to enforce the require- ments for the data element "shipper" as promulgated in the 24-Hour Rule. (Source: HK Law). Protection (FDEP) and takes into con- sideration new regulations on cruise vessel operations in certain Alaska waters. 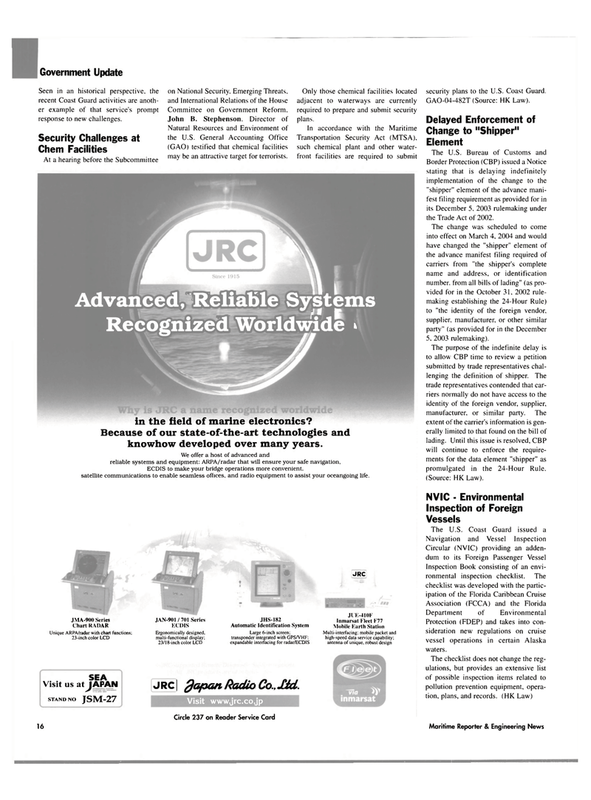 Recognized Worldwide * in the field of marine electronics? Because of our state-of-the-art technologies and knowhow developed over many years. We offer a host of advanced and reliable systems and equipment: ARPA/radar that will ensure your safe navigation. ECDIS to make your bridge operations more convenient, satellite communications to enable seamless offices, and radio equipment to assist your oceangoing life.